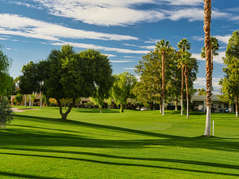 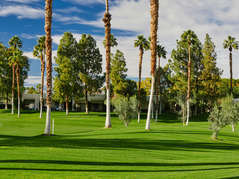 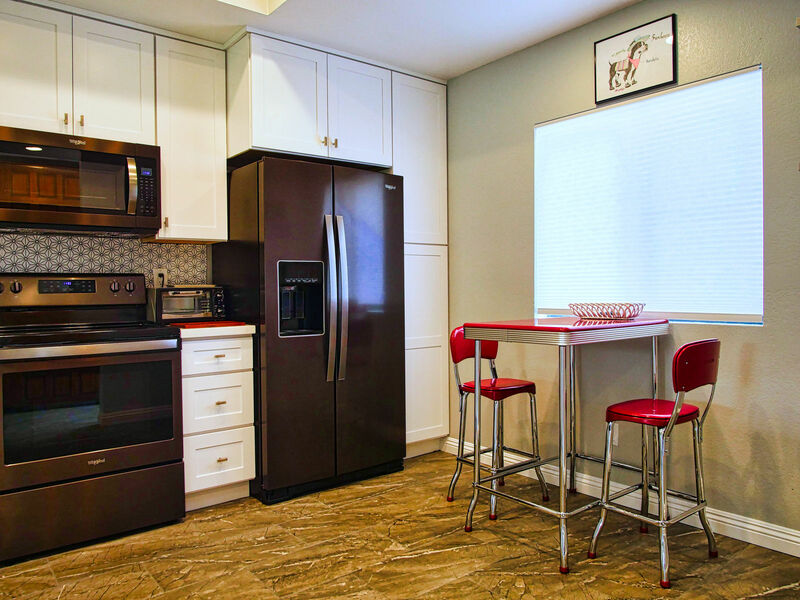 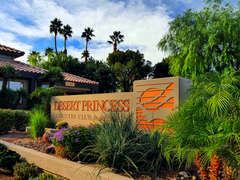 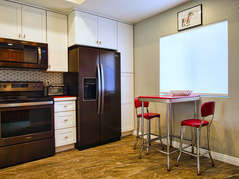 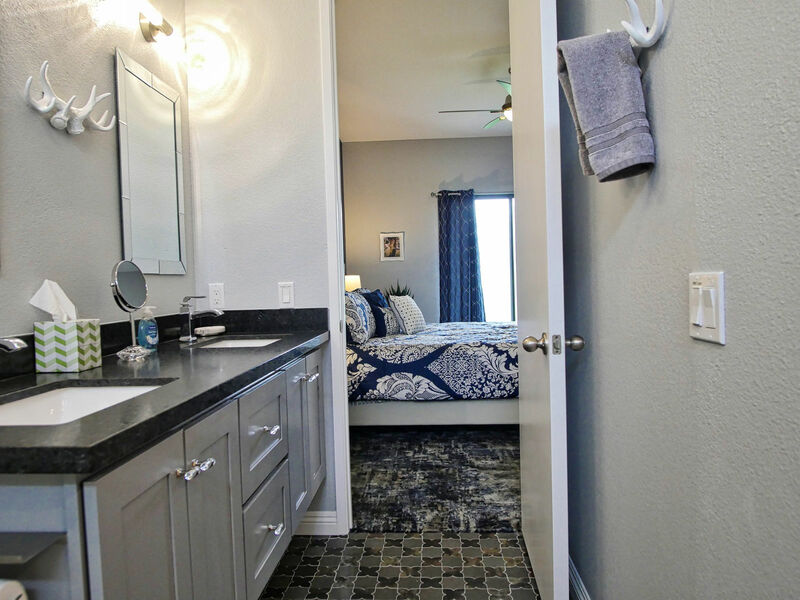 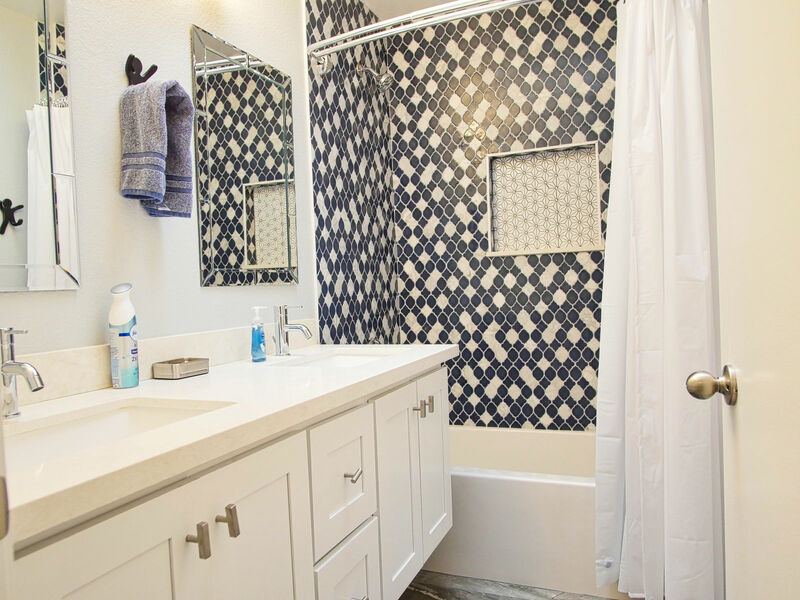 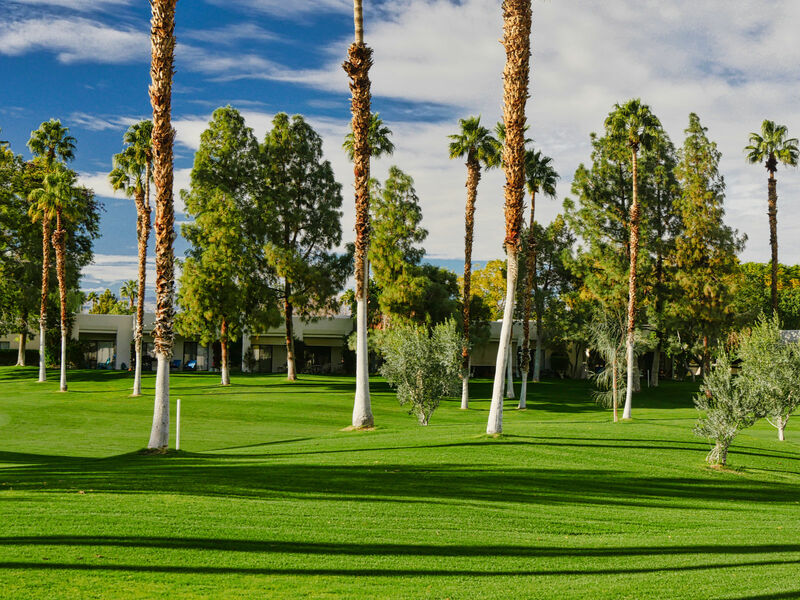 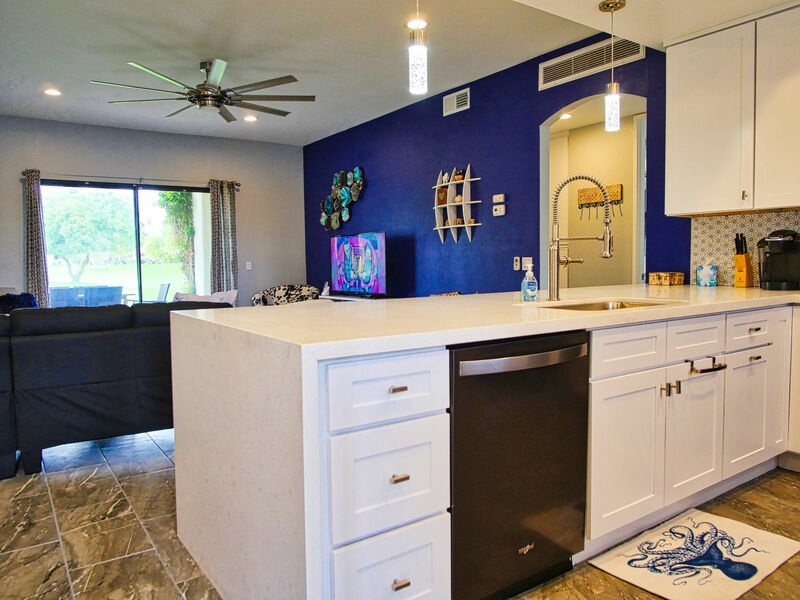 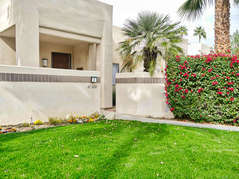 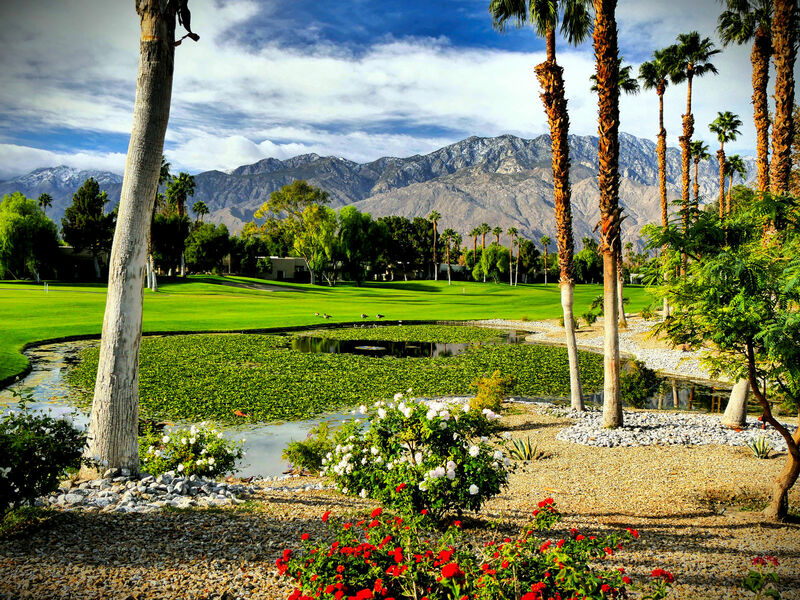 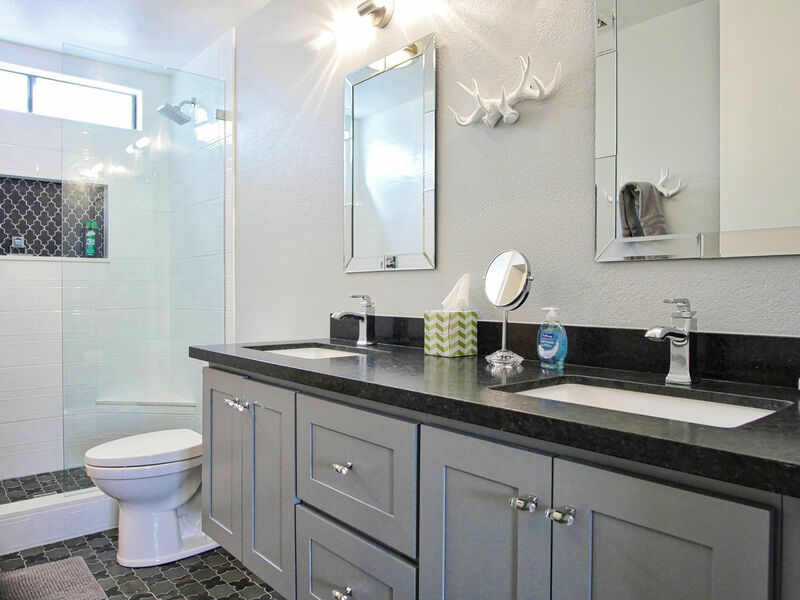 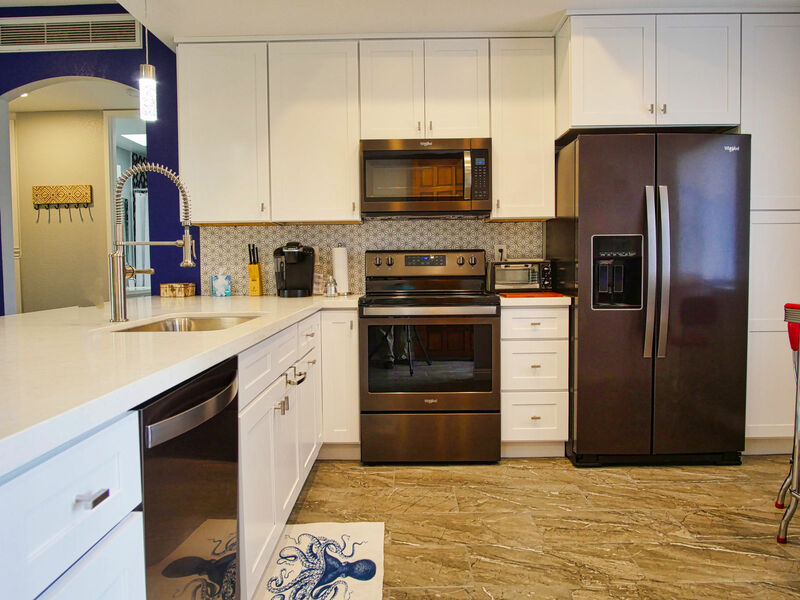 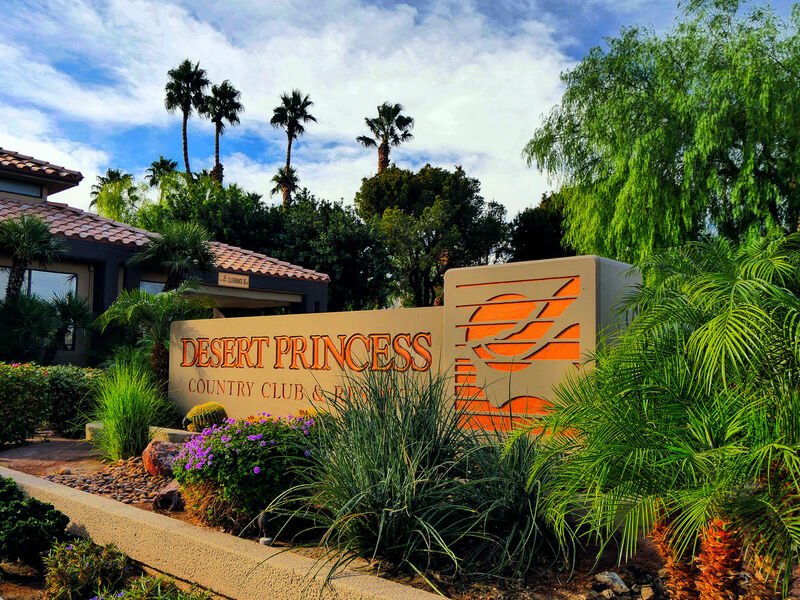 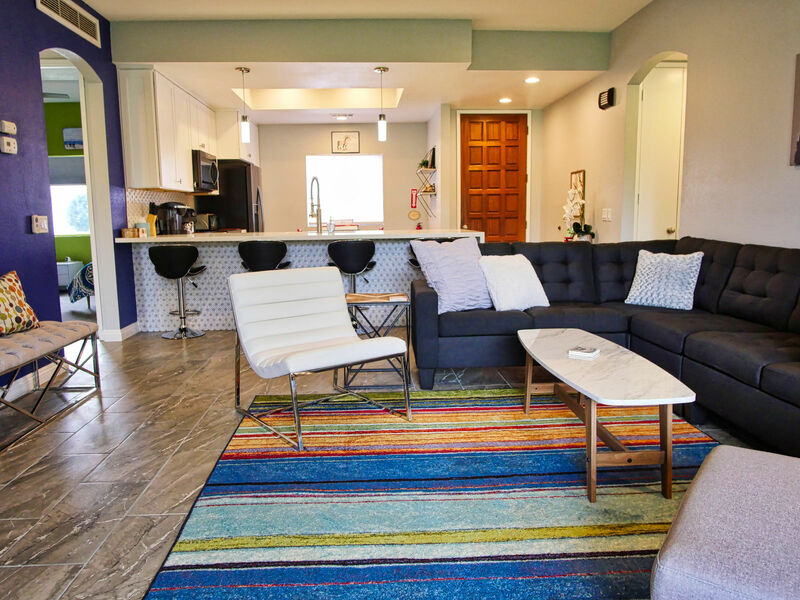 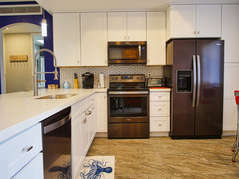 Location is key here at Desert Princess and this completely renovated 3 bed/2 bath has it all! 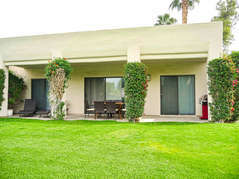 This end unit “Casa de Cuatro Zapatos” condo sits facing north-west on the 4th hole of the Cielo golf course. 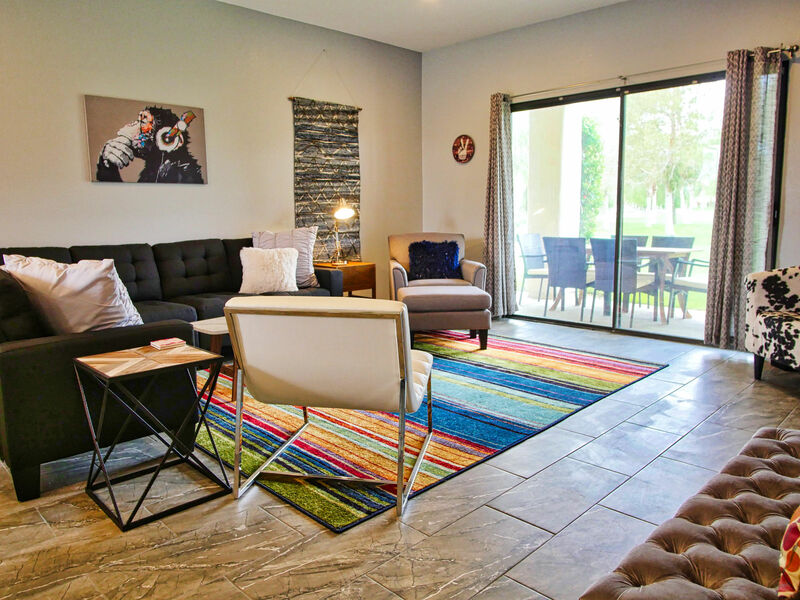 Golfers play past this condo, so no incoming balls to worry about. 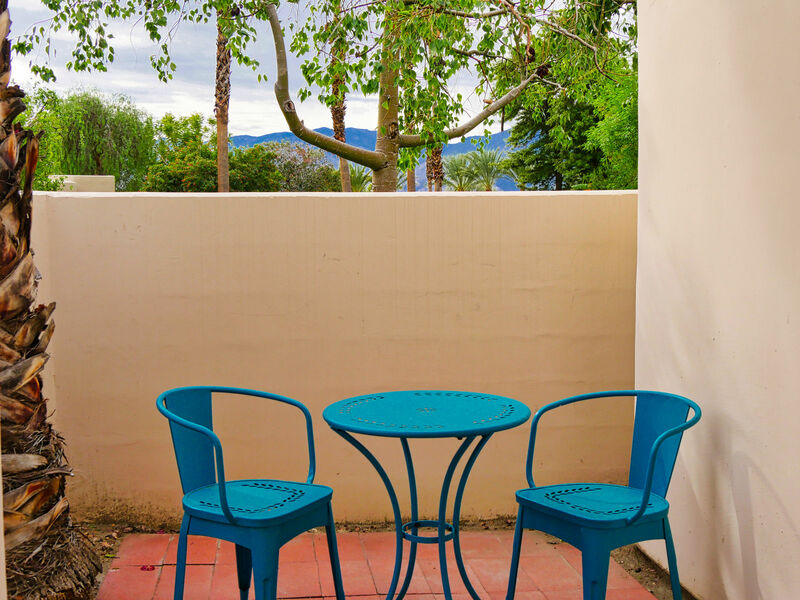 A heated pool and hot tub are just 50 feet away to the west of this midcentury-modern-glam decorated unit; easy access without being on top of it. 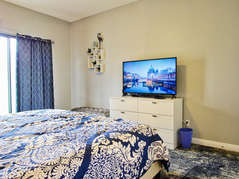 Location and privacy!! 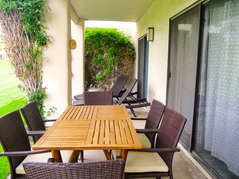 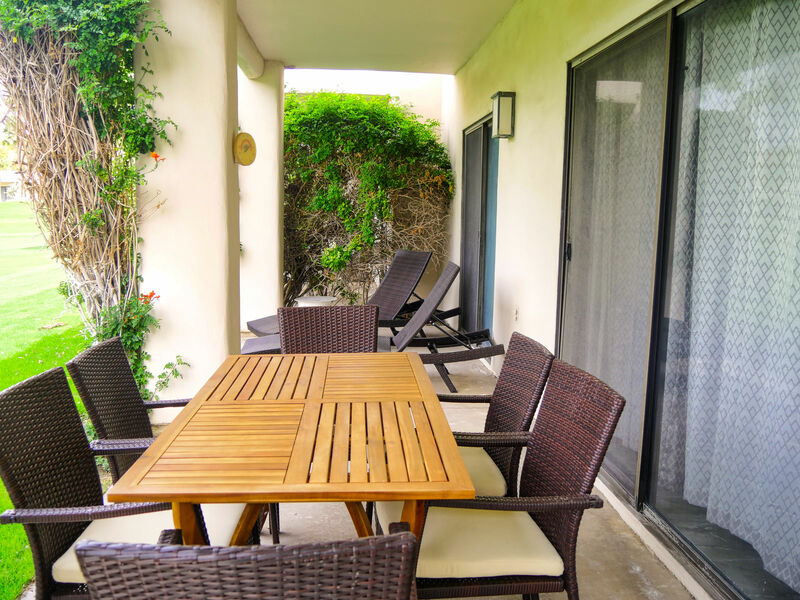 Enjoy the large patio with brand new lounge chairs, a large teak dining table, and a new red gas grill ready to go. 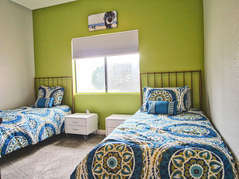 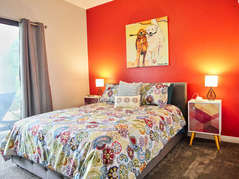 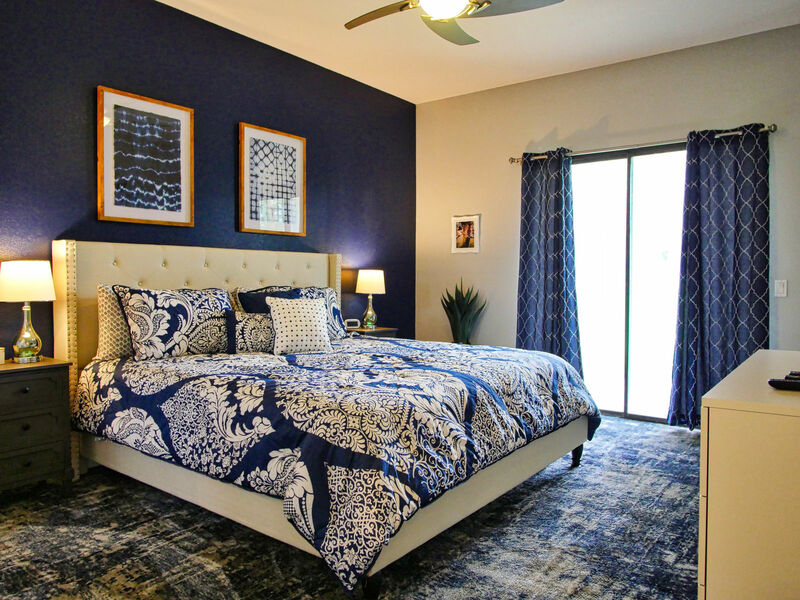 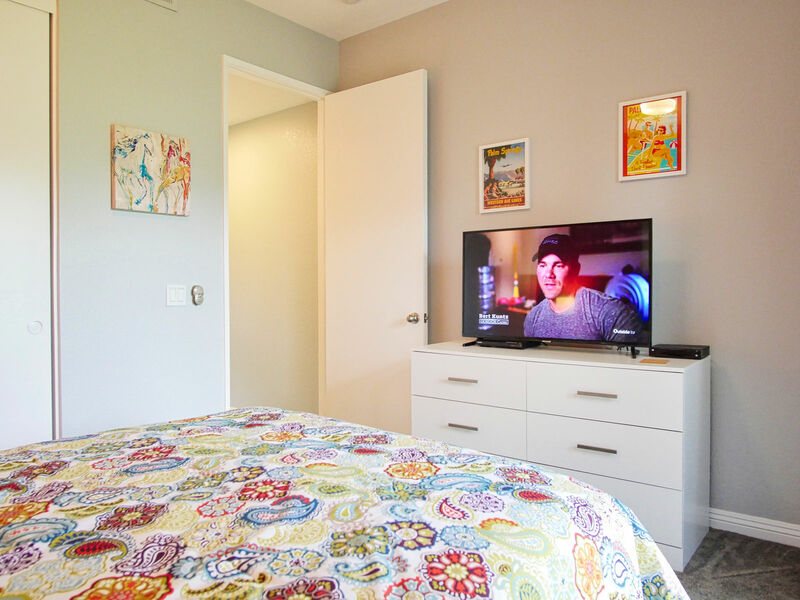 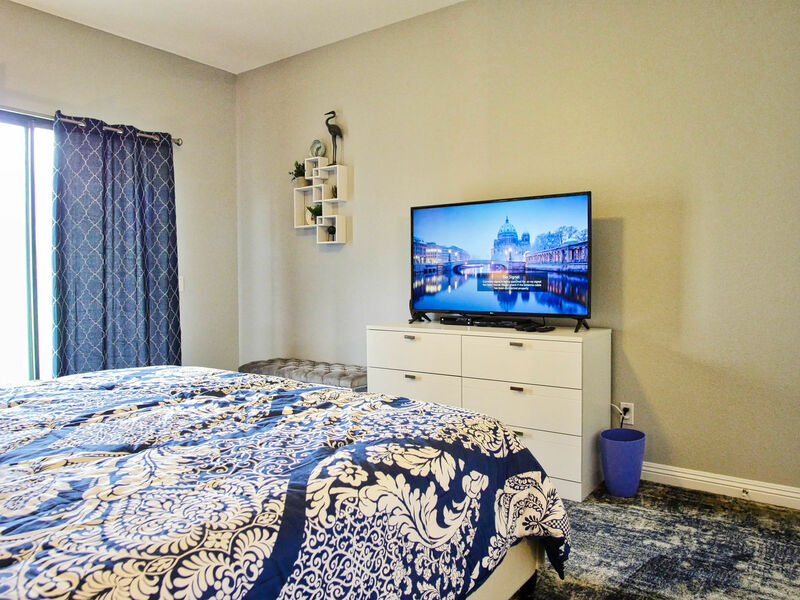 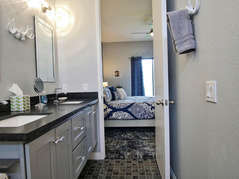 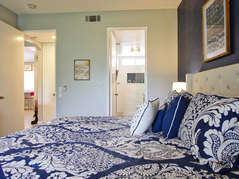 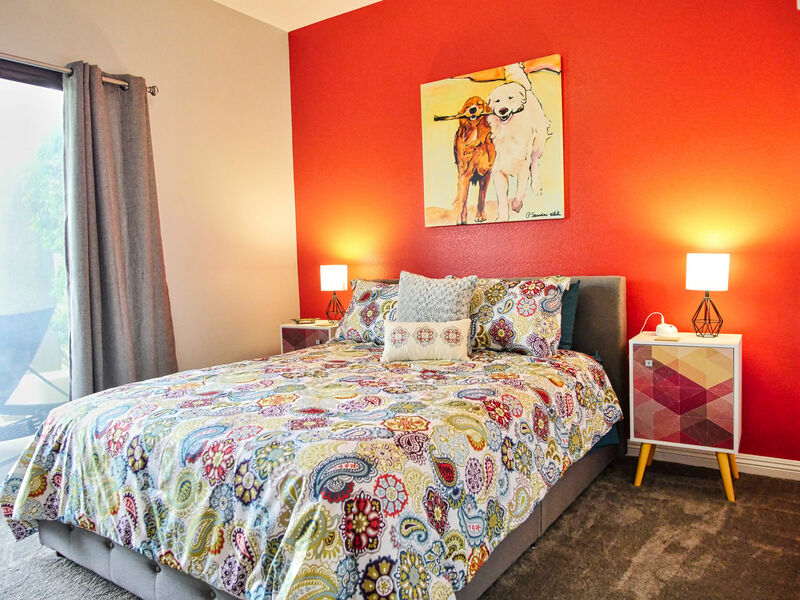 The master bedroom has a king-sized bed, the first guest bedroom has a queen-sized bed and the third bedroom has two singles (or twin-sized beds). 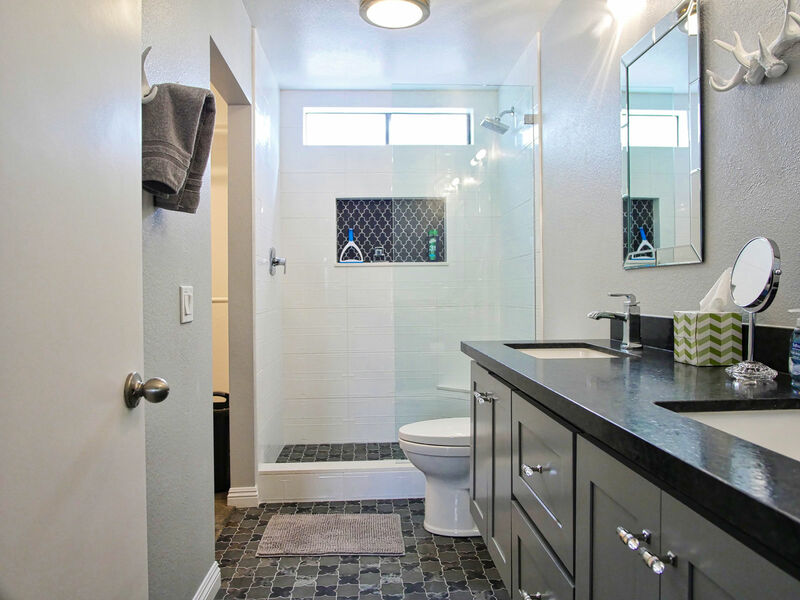 One of the bathrooms includes a bathtub and shower and the other has a full shower. 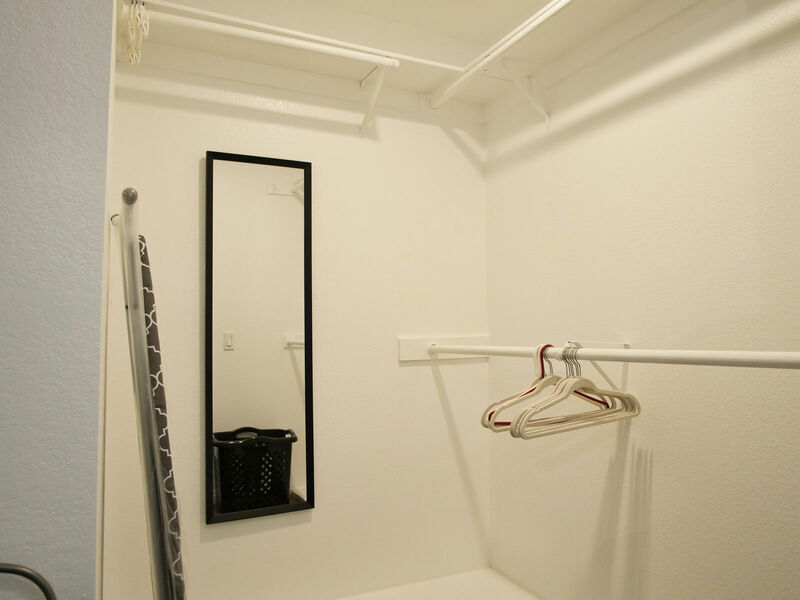 A one car garage is included in rentals which can be long or short term. 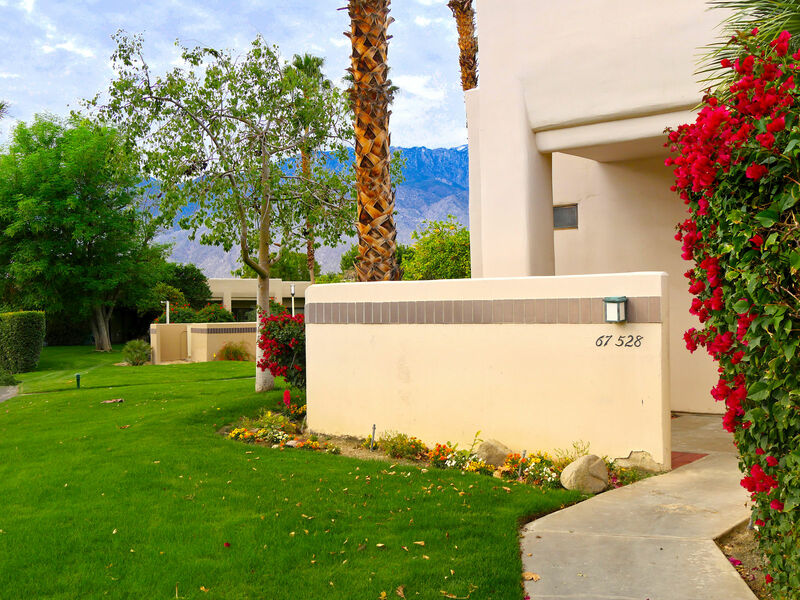 This dog-friendly condo has great mountain views, many fruit trees around to pick from, and beautiful palm trees on the front porch! 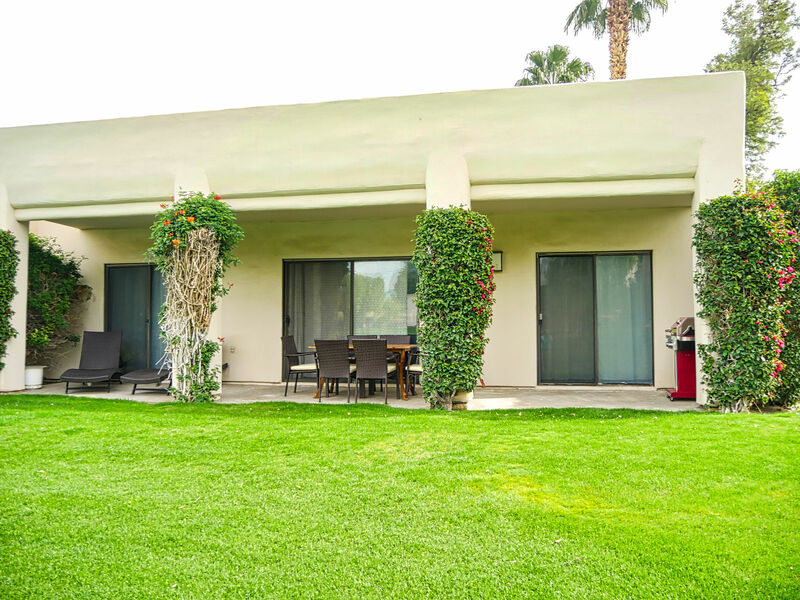 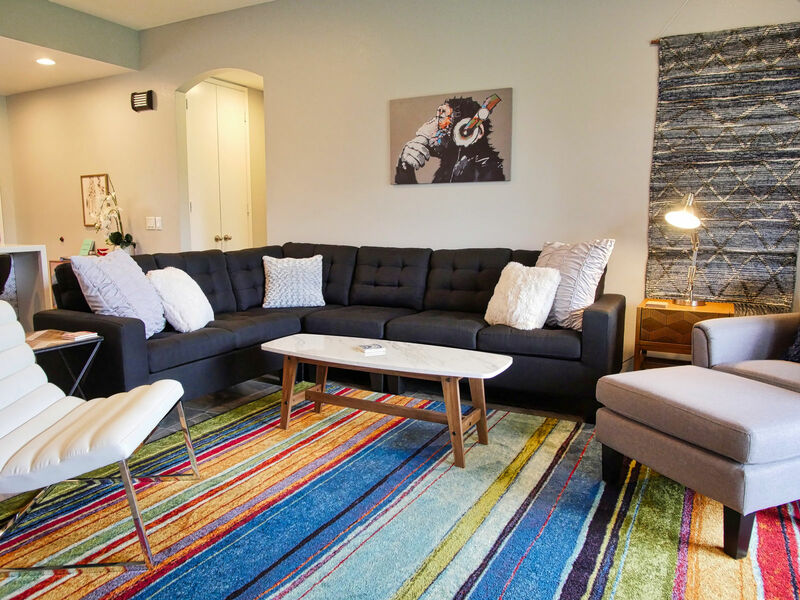 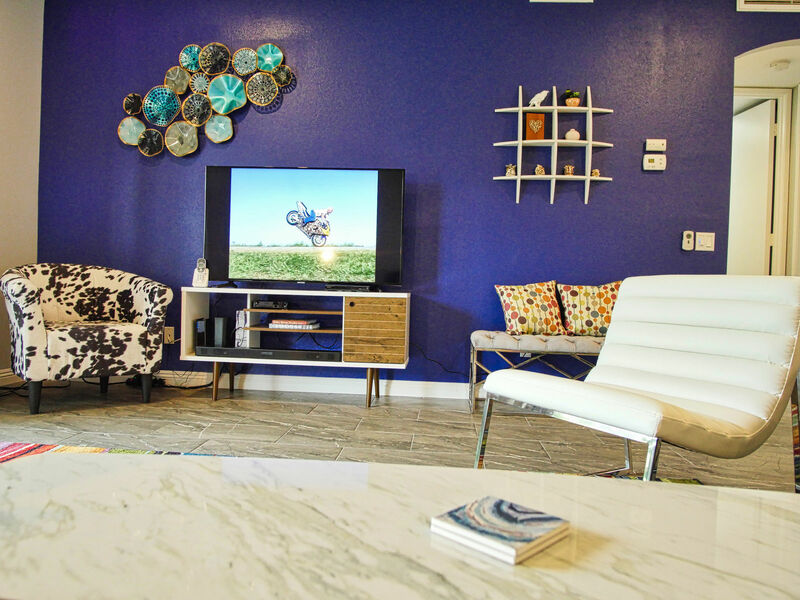 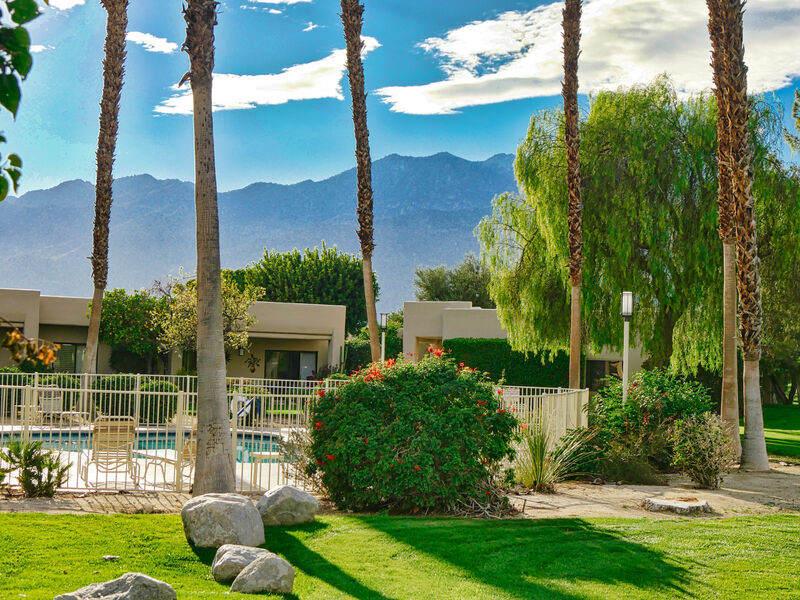 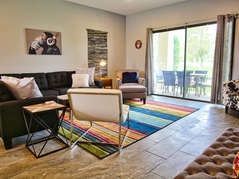 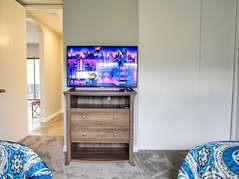 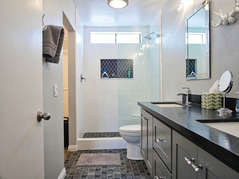 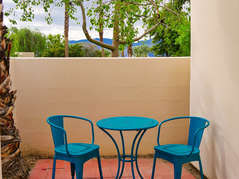 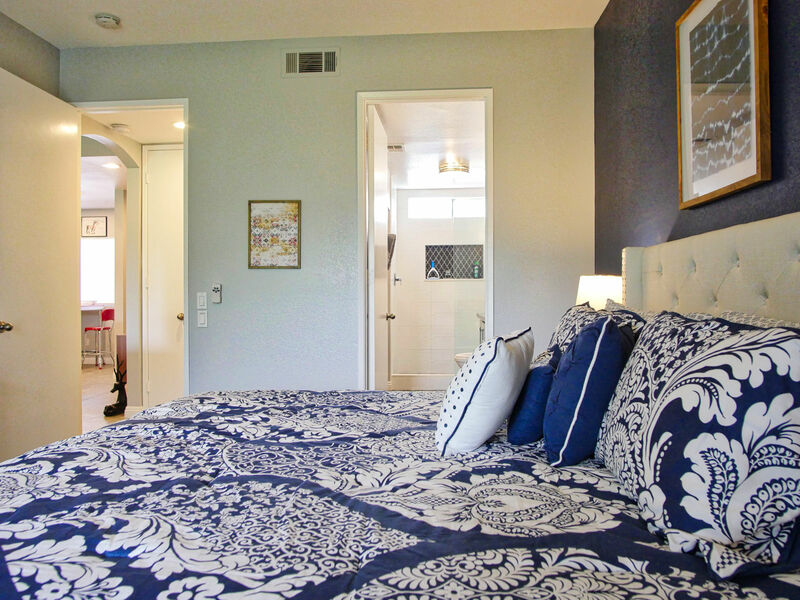 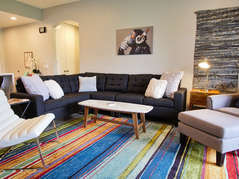 Owners carefully chose the design themed to maintain the Palm Springs vibe with geometric tiles, bright colors, clean lines, and wonderfully comfortable beds. 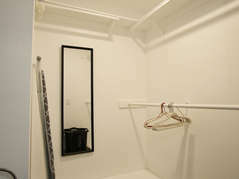 Everything is brand new. 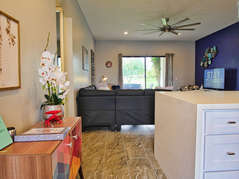 Come and visit Case de Cuatro Zapatos and discover how it got its name!